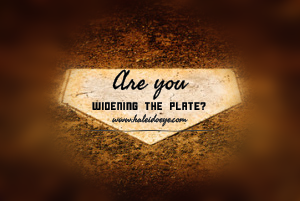 Are you widening the plate? For the last twenty years, I’ve had the great fortune of spending thousands of hours with youth, in various capacities. I’ve laughed with them, cried with them, and celebrated mightily with them as they learned to navigate the often winding roads of adolescence. While I recall countless moments of absolute joy as students (or athletes) reached various milestones in their life, the single greatest source of joy has come as a result of a child realizing what I believe to be one of life’s greatest lessons – the realization that I am responsible for me. Personal responsibility (or accountability) is simply saying, “I am the driver of my life.” Therefore, as the winding roads appear, I’m left with a critical choice. A choice to be a victim (blame, excuses, and denial) or a victor (ownership and responsibility). As parents, teachers, and coaches, I believe one of our greatest responsibilities is to empower young people to take ownership of their lives. While there are many ways to go about this, the most meaningful way is to model who we expect them to be. In others words, if I live a life of accountability, the young people in my circle of influence will catch this skill. As is often the case, more is caught than is taught. Below is a powerful story that uses a baseball analogy to drive home this point. Twenty years ago, in Nashville, Tennessee, during the first week of January, 1996, more than 4,000 baseball coaches descended upon the Opryland Hotel for the 52nd annual ABCA’s convention. “Who is John Scolinos?” I wondered. No matter; I was just happy to be there. In 1996, Coach Scolinos was 78 years old and five years retired from a college coaching career that began in 1948. He shuffled to the stage to an impressive standing ovation, wearing dark polyester pants, a light blue shirt, and a string around his neck from which home plate hung — a full-sized, stark-white home plate. “Seriously,” I wondered, “Who is this guy? After speaking for twenty-five minutes, not once mentioning the prop hanging around his neck, Coach Scolinos appeared to notice the snickering among some of the coaches. Even those who knew Coach Scolinos had to wonder exactly where he was going with this, or if he had simply forgotten about home plate since he’d gotten on stage. After a pause, someone offered, “Seventeen inches?” More of a question than answer. Another long pause. “Seventeen inches?” A guess from another reluctant coach. “SEV-EN-TEEN INCHES!” he confirmed, his voice bellowing off the walls. I was amazed. At a baseball convention where I expected to learn something about curve balls and bunting and how to run better practices, I had learned something far more valuable. From an old man with home plate strung around his neck, I had learned something about life, about myself, about my own weaknesses and about my responsibilities as a leader. I had to hold myself and others accountable to that which I knew to be right, lest our families, our faith, and our society continue down an undesirable path. Am I widening the plate in my own life? Am I widening the plate for the young people that I influence? If the answer to either of these is “yes,” now is the time to take ownership. It’s the greatest gift you can give to yourself and others. As usual Mike, you hit the nail on the head. Love you! You are inspiring! Thank you, Georgia. As always I’m grateful for your support. All my love to you and the Hufanga family.